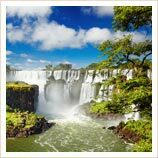 Straddling the border between Brazil and Argentina, this magnificent series of waterfalls is simply breathtaking, not just in their natural beauty but in the sheer force of the falls. A holiday in Iguazu Falls is an almost humbling experience as you feel the raw power of millions of litres of pounding water hitting the rocks just a few metres from you and see the huge semi-circular series of falls open up before you. You can tour the Iguazu Falls from either the Brazil or the Argentina side, but if time allows, we'd hugely recommend doing both - each offers its own unique perspective, with the Brazilian side giving you amazing panoramic views right across the canyon of the Rio Iguazu to the Falls themselves, while the Argentine side has a series of walkways snaking out over the river to the falls so you can get up close and personal with these natural monsters. And if you want to make an adventure of things, why not take a white-water rafting trip on the Rio Iguazu to the very base of the falls themselves...? 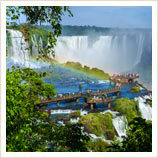 All our holidays and tours of Iguazu Falls can be 100% tailor-made, so just get in touch to plan your dream trip! Whichever country you stay in on your holidays in Iguazu Falls, you'll find a decent range of hotel accommodation, and assuming you plan to see both sides of the Falls, where you choose to stay may well depend more on whether most of the rest of your holiday is in Brazil or Argentina than anything else. On the Brazilian side the town of Foz do Iguacu isn't exactly a sprawling metropolis but it's well provided with hotels and restaurants and is a good base for tours of Iguazu Falls. It's about 20km from the National Park and Falls entrance so you can either choose to stay in town where you have easy access to restaurants, banks and other facilities, or you can stay at a hotel near the National Park so that you can have easier access to the Iguazu Falls themselves. If you're staying in town then our favourite is the Recanto Park, but if you'd rather be a bit further out then the San Martin Resort has a big pool and recreational areas, or if you're planning a special trip you can upgrade to the lovely Das Cataratas property from Belmond, where some of the rooms even have direct views of the Falls. The Argentinian town of Puerto Iguazu is quite a bit smaller than Foz, but arguably offers better hotels. Again, you have a choice between the many hotels in town (and the restaurants here are great and a little cheaper than on the Brazilian side) and a handful outside on the way to the Argentine Iguazu Falls National Park. In town the Iguazu Grand and the Panoramic are both very good, and have views over the river, and in the National Park there are two great options to consider as well. The Sheraton Iguazu is an incredibly unattractive building BUT... the rooms are actually good and not only do half the rooms have Falls views, but the grounds do as well. Alternatively, the new Loi Suites Iguazu is right in the middle of the National Park and with fabulous rooms and a stunning decked pool area it gives you a real rainforest adventure feel. Obviously the Iguazu Falls are the main reason you're in town, and although you can visit them by yourselves, once you've added up the costs of transportation and entrance fees, a tour is usually very cost-effective. It's possible to see both sides in a day, but most people choose to take two separate half-day tours, one to the Brazilian side and one to the Argentine side. If you've stayed on the Brazilian side we usually recommend a private guide to visit the Argentinian side (and vice-versa) as it makes the border crossing much quicker and smoother. Another great way of getting up close to the falls is to take one of the many rafting or speedboat adventure trips out on to the River Iguazu. You can take these trips separately or you can include them in a regular Iguazu Falls tour, and plunging through the rapids on the river, or darting in and out of the huge waterfalls on a fast speedboat is great fun. The Rio Iguazu actually forms part of a triple border with Argentina, Brazil and Paraguay, and you can easily add a third country to your holiday in Iguazu by taking a trip over the Friendship Bridge into the Paraguayan city of Ciudad del Este. It's a little more down-at-heel than either Brazil or Argentina, but because it's a special duty-free area it's always packed with Brazilians and Argentinians looking for bargains! 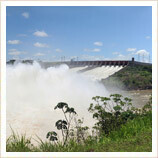 Further up the Rio Iguazu you can also visit the huge Itapiu Dam, which was built as a joint effort between Brazil and Paraguay, and is the largest hydro-electric plant in the world. There are regular guided tours of the dam and its associated museum, and it honestly is so huge that it's genuinely impressive. In Brazil, there are a large number of restaurants in Foz do Iguacu, especially Italian restaurants and the local churrascaria grills. These specialise in grilled meats (although they usually also have huge salad bars including numerous side dishes) and you should definitely try at least one while you’re here. The Rafain is near to the hotels and is popular with tourists, but you do also get locals heading there, particularly on a weekend. However, our favourite is probably the Bufalo Branco, on Rua Engeneiro Rebouças. 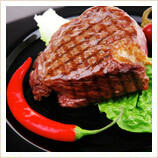 The choice of cuts of meat is staggering and it’s all beautifully cooked. The salad bar is massive too, so even if you’re not feeling meaty it’s still a good shout. Just around the corner from here, on Avenida Kubitschek, you’ll find Foz’s best pizza restaurant, La Bella Pizza, which is a cut above most of the cheap’n’cheerful pizzerias here. Finally, for a more special meal, try the Clube Maringa. With lovely views of the river, and specialising in grilled fish (excellent salad bar again) it’s a great spot to relax and take your time over things. Just like Brazilians, Argentines love their grilled meats and you'll find lots of great parilla steakhouses here in Puerto Iguazu. El Quincho de Tio Querido, on Calle Bompland is lively with both tourists and locals, and has a well-priced parilla selection. It’s just around the corner from one of our regular hotels, the Jardin de Iguazu, so might be a good choice for your first night. A block further down Bompland, you’ll also find La Mama, which doesn’t look like all that much from the outside, but does Iguazu’s best pasta and has a superb in-house bakery doing great empanadas. Avenida Cordoba is home to most of Iguazu’s better restaurants, and you’re likely to find yourself here more often than not... One particular favourite here - and an Iguazu institution - is La Rueda, which does a great line in river fish, alongside the usual parilla meats and great salads. A little further up Cordoba, you’ll find La Esquina, which is one of our favourites for dinner, as it has a lovely terrace for evening dining – perfect in this tropical climate. If you’d prefer a night off the steaks, then you can try one of Iguazu’s Italian restaurants, of which La Toscana is arguably the best – particularly for veggies. It’s also on Avenida Cordoba, although right at the northern end, down by the river. Unusually for Argentina, it has an open kitchen so you can watch your chefs at work as well! Meanwhile, if you’re specifically after pizza, then Parilla Pizza Color (also on Cordoba) is probably Iguazu’s best. 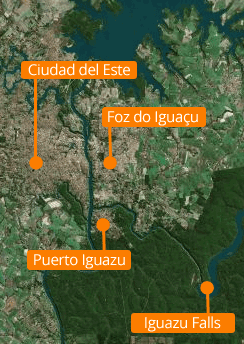 Both Puerto Iguazu and Foz do Iguacu have proper airports, and are well-served by domestic connections. 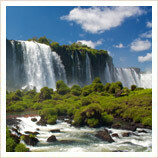 From Puerto Iguazu there are several daily flights to Buenos Aires as well as regular flights to Salta and Cordoba. 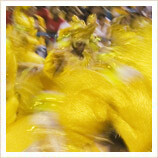 From Foz there are direct flights to Rio, Sao Paulo and Curitiba with onward connections to just about everywhere in Brazil. There are also international flights to and from Lima in Peru, which makes it easy to combine a holiday to Machu Picchu with a visit to Iguazu and Rio or Buenos Aires. Again, from each side of the border there are decent road connections into Brazil and Argentina, although the distances involved are significant. Even to Curitiba in Brazil or Santa Fe in Argentina, you're looking at around a 12-hour drive, so the cheap internal flights do make sense if you're at all time-pressured. If you're planning a holiday in Iguazu Falls with us then most of your transport needs will be covered by your tours and transfers but in any case, public transport on both sides of Iguazu Falls is present, although limited. You can certainly get to and from the Falls, and between Foz and Puerto Iguazu on the local buses, but at least some degree of Spanish will probably come in handy. Another option is to use the plentiful taxis to get around. In Brazil, a taxi from the National Park entrance into town will be around R$25, and the same journey in Argentina would be around ARS$50. The Iguazu Falls have a humid, sub-tropical climate with only two seasons – hot and humid in the summer and drier and colder in winter. 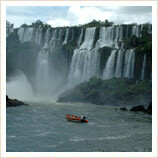 Whilst the Iguazu Falls area is generally a sunny place, rain is common in spring and summer, but many people feel this is actually the best time for a holiday to Iguazu Falls, as the more frequent showers swell the water levels of the river, making your tour of the Iguazu Falls even more impressive. All our South America holidays are tailor-made, and with regular flights to Rio, Lima and Buenos Aires we can easily include a trip to Iguazu Falls as part of any of our tours of South America. 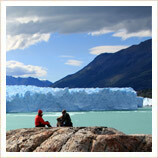 Just get in touch with our friendly and experienced advisors and we can come up with a bespoke itinerary to suit you! There is a lot of controversy over how to judge which is the world's biggest waterfall. Victoria Falls in southern Africa is slightly higher (100m compared to Iguazu's 82m) but Iguazu is wider (2,700m compared to Victoria's 1,600m) and has a much higher volume of flow (averaging 1,707m3/s compared to just 1,088m3/s at Victoria), so... let's be nice and just say that everyone's a winner!